Wisdom of the Owl is chapter eight of What Animals Can Teach Us about Spirituality: Inspiring Lessons of Wild and Tame Creatures and plays a different role from those of the first seven. 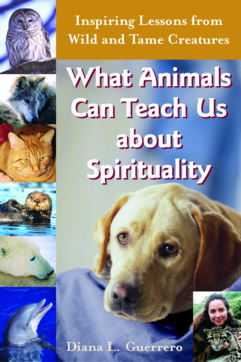 It includes practical instruction on how to develop your skills to connect with animals and, ultimately, with the Divine. "My meeting with a Native American couple didn't seem too unusual at the time, but I did notice the appearance of an owl, a normally nocturnal creature, who chose to fly back and forth above us throughout the duration of our conversation. Later the same evening, miles away at my home, an owl appeared and vocalized outside my window. If that wasn't enough, owls and other winged messengers visited my dreams that night. When I stumbled across an owl feather deposited on my driveway the following morning, I decided the appearances of owls in real life and in my dreams meant that I need to pay attention. In ancient Greece, the owl was associated with higher wisdom. There are many different folktales about this creature, and the stories about prophecy and the gifts of clairvoyance and clairaudience allude to the owl's acute vision and hearing. The owl's large eyes pick up subtle movements. Her head swivels in a large arc to allow a wider view--she is flexible. This raptor is capable of silent observation and flight, which makes her a great hunter. After consuming every part of her prey, she later discards parts with not nutritional value by regurgitating small tight bundles of bone and fur, called pellets..."